An added benefit of living in Eastern Province of Saudi Arabia is that one can visit other nearby GCC countries by road. Most of these states offer visit visa on arrival to GCC residents of certain professions. During my stay in Khobar (Saudi Arabia), I have visited Bahrain several times as it’s just at an hour drive from my current city. You can read more about my Bahrain experiences by clicking here. However, Qatar is relatively far from Khobar. Qatar border is around 300 km from Khobar city of Saudi Arabia and it takes further 90~100 km to reach Doha – the capital of Qatar. Total travelling time is around 4 hours plus approximate 1 hour for immigration and border crossing. This time for border crossing is variable depending upon the time you are crossing the border. During eid holidays, it could prolong up to 2~3 hours for whole immigration process. However normally, on weekends, it shouldn’t take more than an hour. My below text is for guideline only based on my personal experience. One should always refer to the Qatar’s MOI official website for latest visa requirements. Documents Required: No special document is required. Passport, original Saudi Iqama and Saudi Exit/Re-entry visa are sufficient. Documents Validity: All documents (passport, Saudi Iqama and Saudi Exit/Re-entry visa) should have a minimum validity of three months. Visa Duration: One month and can be extended up to three months. The procedure of crossing Saudi-Qatar border is pretty simple. In fact, I have observed that procedure of crossing GCC states border is more or less same. So if you understand below, you can expect similar steps while going to UAE, Oman or Bahrain etc. There are three steps for exiting Saudi Arabia. One doesn’t has to come out of car in this process. Everything can be done while officials remain in their booths and you remain seated in your vehicle. Step-1: At first booth, you will be given a small white paper for vehicle export. They have installed cameras which will automatically detect your car number and the small paper will be given to you. At max, the guy may ask you about number of passengers in the vehicle. This small paper will be stamped at various booths during the process until it is collected by Qatari officials at the last step. All immigration and customs booths on both sides are almost similar to below one. Step-2: The second booth is for immigration. The official will collect passport, Saudi Exit/Re-entry visa and Saudi Iqama. After necessary entries in the system, he will stamp the passport with Exit seal and give you back all items. Step-3: At this booth, the official will simply verify the exit-stamps on your passports and may match photos on passport by looking at you and will let you go. For women in veil, there is a separate women-only small cabin next to this booth. Veiled-women may have to go there for face recognition. Now you have exited Saudi Border. There is a short length of road, around 10 km, between Saudi & Qatari border. I am not sure which state own this short patch. Step-4: This is the first Qatari booth for immigration. 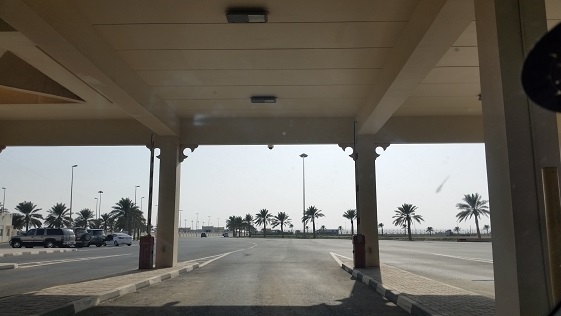 GCC citizens do not require visa to enter Qatar, so they go directly in the vehicles queue for immigration. However, GCC residents need a visa. There’s a separate building beside immigration booth. 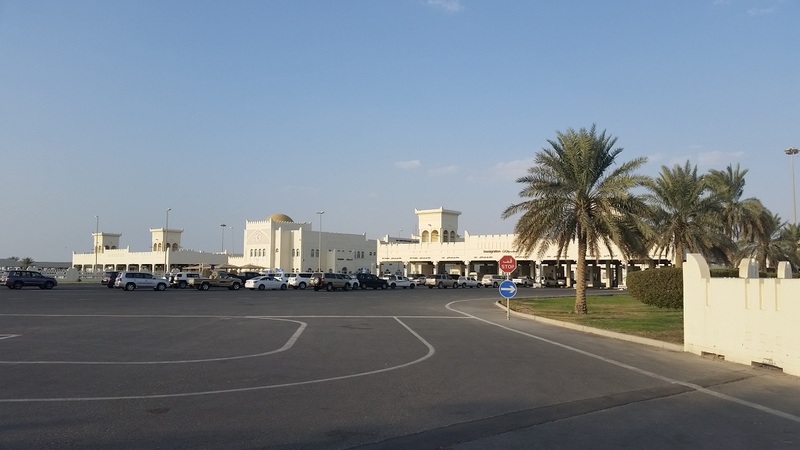 If you are GCC resident, you have to park your car there and go inside the building to immigration counter to obtain a visa. 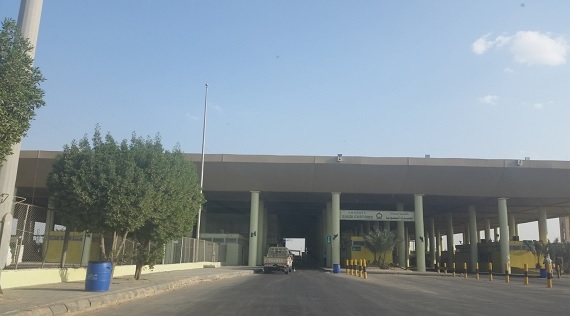 Here, the official will collect your passport, Saudi Iqama and the small slip of vehicle export. He will inquire you about your destination in Qatar and your Saudi mobile number for entry in the system. He will also ask you for the visa fee. As I said before, Qatari visit visa fee is QR 100 per person. Be noted that Qatar immigration counter is cash free i.e. cash is not accepted for visa fee. So, you have to pay the fee through your credit card. If you don’t have a credit card, there is a Qatar National Bank (QNB) branch opposite to this immigration building. You have to go there and purchase an e-cash card which will cost you QR 30 in addition to visa fee. You can keep this card for your next Qatar trip or you can return it back to bank after paying visa fee for QR 20. J Qatari visit visa is a small bar-code sticker. If visa is granted, the immigration officer will paste the sticker on your passport and stamp it. Qatar immigration building can be seen behind the vehicle’s queue. Step-5: After getting visa, go back to your car and move to Customs booth. The official will ask for your driving license and your car’s registration. After some entries in system, he will return you all items and will give a slip (half of A4 paper size). Step-6: Next booth is Custom clearance. Here, they will ask you to park your car and open car’s boot. Mostly, it’s just a formal inspection. Once satisfied, the official will stamp the half-A4 size custom clearance paper and will let you go. Step-7: Now you have to drive to next booth which is for Vehicle Insurance for Qatar. Insurance fee is QR 96. You can also pay in Saudi Riyals. Cash is accepted here, no need of credit card. The guy will give you vehicle insurance paper. You have to keep this insurance paper with you throughout your stay in Qatar. Step-8: This is the last booth. Here, the officials will ask for your iqama or passport for verification and will take both vehicle export and custom clearance slips. Congrats, you are done now and free to wander in Qatar. Step-1: First booth is Qatar customs. Here you will get a small paper of vehicle export. Step-2: Next booth is for immigration. The official will stamp your passport with Qatar Exit Seal. Waiting at Qatari immigration booth to get passports back. Step-3: At third booth, he will simply verify exit seal on your passport. This is the last Qatari booth. Next after travel of few kilometers, Saudi border will start. Step-4: Saudi official will stamp Entry seal on your passport. Welcome back to Saudi Arabia. Step-5: Customs check. They will ask you to park your car inspection. After that he will stamp on vehicle export paper as well as will give you another small paper of custom clearance. Step-6: This is last Saudi Booth. They will verify Saudi Entry stamp on passport and will take both vehicle export and custom clearance slips. Congrats again, you have safely made your trip of Qatar. One thing I noticed that all Saudi officials were male and were not fluent in English. On the other hand, on Qatari side, I saw both men and women and they were relatively good in English. Also be careful in driving near border as I saw long queue of loaded trucks, most of them going to Qatar from Saudi Arabia. Seems that Saudi Arabia enjoys more share in cross country trade. 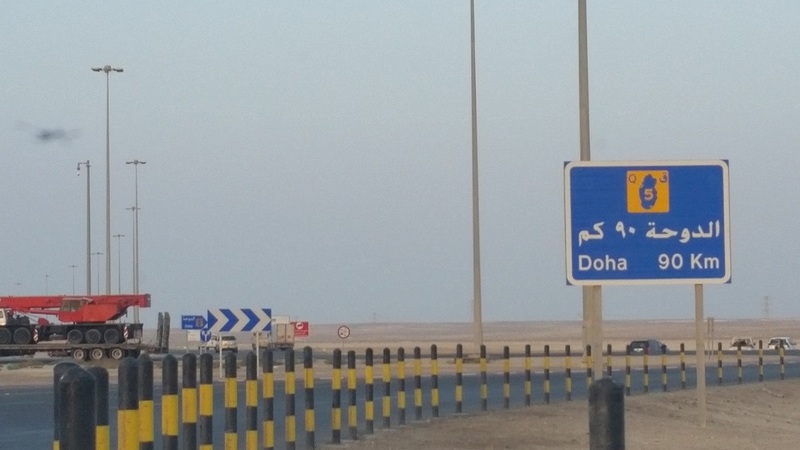 There are a number of speed cameras on Qatar highway, one speed camera every 8 km, I guess. However, speed cameras are scarce on Saudi Arabian side or perhaps, no fixed speed camera at all on KSA side. hello sir, I’am an expat here in saudi arabia, im a filipina and im planning to travel and visit my friend in doha qatar, a travel agency from doha is the one who process my visa, my question is can i return back to saudi after my 5 days vacation in doha? is that possible despite of the conflict happening between the two country? Yes, you can enter Qatar and return back to KSA but the problem is no direct flight from KSA to Qatar or Qatar to KSA vice versa. Your flight should be from other countries not blocking Qatar. Either you go KSA to Sri Lanka to Qatar. then Qatar to Sri Lanka to KSA. Please note that Philippines Passport holder are visa on arrival in Sri Lanka so there is nothing to worry about the pre visa arrangement if you enter Sri Lanka. If you opt to transfer flight to India From KSA to Qatar it is still possible. Philippines passport holder can get visa to India via e-visa or electronic visa. So many options you can make like going to Armenia or Georgia (partly Europe and Asia) you can get visa on arrival also this two countries before visiting Qatar as long as your holding Philippines passport. Let me be clear to you that there is no direct flight from KSA, UAE, Bahrain, Egypt to QATAR. good work bro and much informative. I have one question, I will be traveling to Qatar this month July 2017 but my residence in Saudi will end up this Oct 2017 but in our Muqeem card it will expire this Oct. 2020 (5 years validity but yearly renewal). In the immigration system they said both Passport and residency should be valid for 6 months. I am worried that if I travel this July it is already 4 months validity on my residency as it need to be renewed this Oct 2017 but shown on my Muqeem card is 5 years. Will it affect to the immigration system? I am an Engineer so no worries about my profession but into the 6 months validity. Although they say six months but as per my friends experience, min 3 months validity is required. Validity of iqama still one year regardless of muqeem card. I visited Qatar last week through Salwa Border. The procedures are exactly same as described in the article which made my travel so easy.. Thanks a lot. PS:- QNB counter was open on Friday also where you can get e-cards. Please advise the procedure to follow if my car is on loan.. i heard NOC required from bank to cross the border by car. What is the procedure to obtain NOC? This is very helpful, informative and to the point. Jezak Allah Khair. If you can do the same for UAE it would be excellent. Thank you very much. It is very informative and detailed information. No questions/concerns are left unanswered. Great job and it is sadqa-e-jaria. Hi My name is Qasim Raza & i am a pakistani national. My profession is General Accounts Technician. Can i have on arrival visa & will they create any problem? What was your profession? Hi, Im an Indian Citizen residence in Kuwait..My profession in Iqamma is Administrator.. is it possible for me to get visa for me & my family and can i go to Qatar by driving my own car? Usually they see original iqama. I am not sure if iqama copy would work. i have all my papers and flightbookings ready.. and the reason why they cant give my iqama is that im going to philippines for vacation after my short stay in doha.. Per my info. Problem is for kuwait not qatar. how they will check our new type iqama card (without iqama validity)? will they ask for any other document? You can take print from internet for your iqama or you can ask your HR guy. Your iqama validity is still 1 year though muqeem card shows 5 year. Yes, visa fee is same for all. SAR is acceptable in qatar but with higher rate, usually 55~60 sar = 50 qar. Better to use credit card. Can we take a rental car into Qatar. Share your knowledge on this ? Thanks for your information, I wanna ask you that my family multiple is going to expire on 30 th August and i’m planing to go Qatar on 20th August but Passport and iqama has long expiry , they will accept this and give me the visa or not? and secondly i’ve my own car under my name is there any requirement for any paper so i can drive my car. Their visa is for one month so i guess not. No extra paper required for own car. with regards to visa near expiry, have they allow you to enter in qatar? Brother hope you are fine. I have read in one or more places that for GCC residents on arrival visa for Qatar, saudi Iqama should be valid for 6 months, so please ensure the validity of iqama as I have a plan to travel to Qatar in first of July and my iqama expiray date is 9th November. Usually they accept iqama validity of 3 months but insist on passport validity of 6 months. Does this Qatar National Bank open in Holidays also like Eid Holidays? If someone reach at the border after sunset, will he be able to pay visa fee without credit card? Hello , Thank you for the important information provided. i entered qatar on 21st june 2016 and i got visa for one month and they gave me car insuranec for one week. how can i renew this car insurance for more weeks untill i exit from qatar that would be before 21st july,2016 . usually they have options. you should have told them that you need longer insurance. anyway, check local insurance agents in the city. how qatar immigration checking our iqama validity? are they asking any other document as iqama validity is not available in our new muqeem card. i have given a link to professions. Check that if your profession is listed. If a car is on finance, do we need any papers from the finance provider to clear it if we are just visiting Qatar ?? Yes. U need a paper from provider to take car out of saudia. Wow well this was interesting to read..never knew anything about this process.